Airwolf is the helicopter from the 1980s American eponymous television series. Its fictional features included stratospheric ceiling, stealth noise signature, a wide range of weapons and even supersonic speed. This is a highly detailed new 2015 version New Century Alloy 1/48 scale Airwolf diecast model by Aoshima/Miracle House. It features many movable parts and motorized main roter and rear roter. 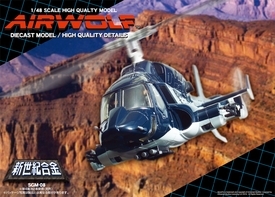 This is a must have for any Airwolf fan!